↑ Geography. Merriam-Webster. Праверана 10 студзеня 2011. 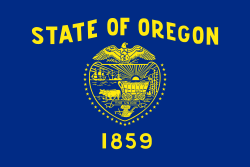 ↑ 2,0 2,1 2,2 2,3 Oregon Almanac:Flag, State (англ.) . Oregon Blue Book. Праверана 10 студзеня 2011. ↑ Shearer, B.F; Shearer, B.S (2002). State Names, Seals, Flags, and Symbols: A Historical Guide (Third Edition ed.). Greenwood Press. p. 67. ISBN 0313315345. ↑ html # two Vexillology - Flags with different backsides (англ.) . Flags of the World. Праверана 10 студзеня 2011. ↑ / flags / us-or.html Oregon Flag (англ.) . Flags of the World. Праверана 10 студзеня 2011. Апошняе змяненне старонкі адбылося 00:36, 16 чэрвеня 2014.